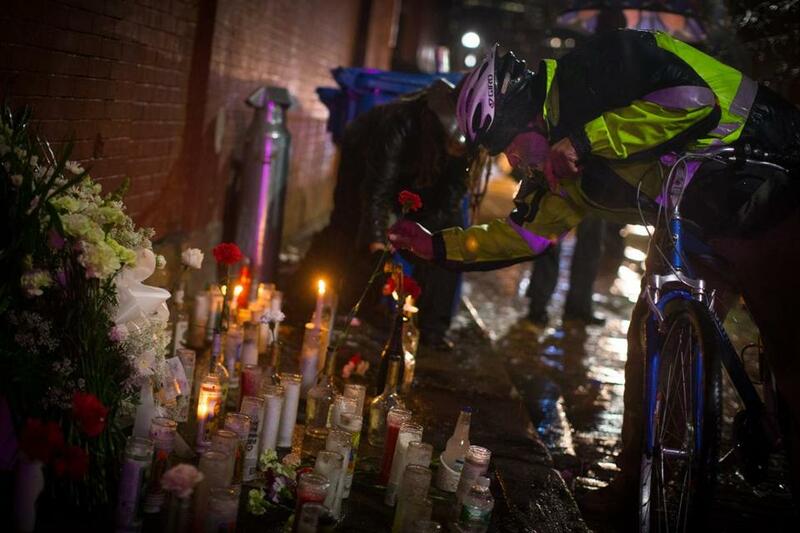 Flowers were placed on a memorial for Wellington Ruiz, a South End resident that was shot and killed. 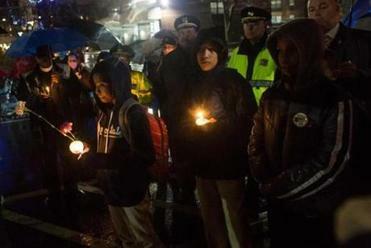 More than 70 people marched for peace in a steady rain in the South End Thursday night after recent shootings left one man dead and prompted calls for action from residents. The marchers held candles and flowers and moved from Blackstone Square park to Aguadilla Street, where 25-year-old Wellington Ruiz was fatally shot on Dec. 9, before concluding the event at O’Day Playground. On Aguadilla Street, the procession stopped by a memorial for Ruiz that included flowers, liquor bottles, and his photo, observing a moment of silence before Emily Duval, 14, read a prayerful reflection written by Maya Angelou. Residents have noticed a surge in addicts wandering dazed into traffic, people camping out in neighborhood parks, and homes being broken into. Police Commissioner William B. Evans also attended and told reporters that while he understands residents’ concerns, the South End has improved dramatically in recent years. “Believe me, this neighborhood is a safe neighborhood and very vibrant,” he said. The commissioner added that crime is generally trending down in the area. While some residents have called for an increased police presence after the shootings earlier this month of Ruiz and other victims who survived, a few teenagers who joined Thursday’s march were skeptical. There should be more community events in the neighborhood, he said. Also among the speakers was the Rev. Mark V. Scott, a Dorchester pastor who said he attended a memorial service for Ruiz earlier in the day. At O’Day Playground, another moment of silence was held before Maizonett read a version of St. Francis’s prayer for peace.